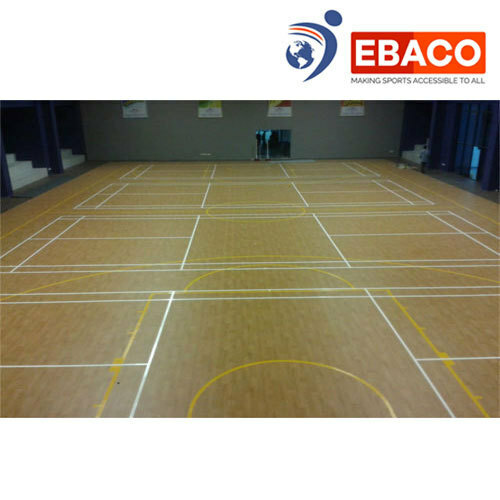 Ebaco offers wooden flooring for sporting purposes. Wooden flooring is considered to be the highest indoor sports flooring available and more expensive than any other product offered for indoor sports. It is a complex product however and has to be installed and maintained properly. The patented technology delivers unmatched shock absorption, traction, and consistent ball response. Ebaco offers sports wooden floors from the US which are certified by all major agencies. Multiple constructions are possible depending on the ultimate requirement of the customer. Our flooring is made from maple wood which is the best wood to use for indoor sports due to its strength and durability and reasonable price point. Wooden floorings are perfect for installations where there will be a lot of wear and tear and weight put on the floor will be high. Our floors are all maple wood-different grades are available. High-quality rubber pads are used to ensure maximum quality and comfort. Sleepers are imported from the US. Different constructions are available with or without plywood sheets. Different top thickness and construction are also possible. Our squash courts can be constructed as per international squash federation standards. Ebaco was established in Germany in 1973, as a company focused on surfaces. In its 40 years of existence, Ebaco has done well over 750 million US dollars in sales. Today, the company has its headquarters in Singapore, and offices in multiple countries and services countries that add up to 25% of the worlds population. in India Ebaco has 9 offices & has executed more than 2000 psports infrastructure projects successfully across Schools, Colleges, Educational Institution, Real Estate, Corporates and Sports Academies. Company offers wide range of sports facilities such as (badminton court, tennis court, basketball court, football ground, Futsal turf pitches, squash court, field hockey, volleyball, golf, cricket, multipurpose ground, children play area rubber flooring, running tracks, Gyms, Education flooring etc.) as per international standards. We at Ebaco provide 360-degree sports infra solution starting from Site survey, consultation, designing, Construction of sports courts, installation of sports surfaces & maintenance. Our mission is to construct world class sports infra facilities in India with a mission of Making sports accessible to all.